The official statistics (FRONTUR) have been announced to the end of October and so giving the earliest and best reflection of the season’s tourism. There was much excitement at the start of October regarding reports of a record 7.1million tourists in 2016. Thankfully the reports were a simple case of error in translation—with the island already struggling to cope with its approaching 3 million even the most money mad mogul in our midst would not wish more than double the current numbers on us. It is generally accepted that the official FRONTUR figures to the end of October are those that give the first true picture of Ibiza’s tourism year. The total number of tourists to the end of October 2016 is just under 3 million at 2,976,087. This represents an increase of 12.61% on the previous year. By nationality, the figures highlight the importance of the British market to Ibiza. 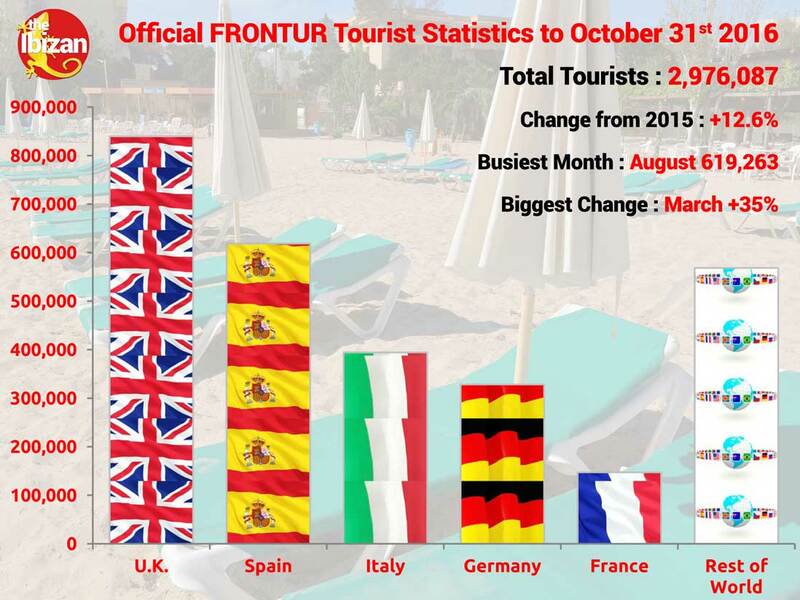 At 839,794 British tourists outnumber even the Spanish at 618,787. British tourists are approximately equal to the German, Italian and French market combined. Every nationality shows some increase on the previous year however, at 0.68% and 1.8% respectively, the German and Spanish markets are relatively static. The biggest increases are of 34.17% for ‘the rest of the world’, and 33.63% for France, though even with that substantial increase the French represent a small slice of the Ibiza pie. British numbers were up 10% however an even greater increase will be required in 2017 if the Consell are to realise their aim of British tourists breaking the 1 million barrier. It is particularly worthy of note that March and October had the two highest levels of year on year increase. In March 34.5% and in October 31.3%, both positive indicators for those behind the push to extend the season. Unsurprisingly August was the busiest month with 620,000 visitors.